There are many ways to experience Burning Man, including just absorbing it all and enjoying yourself by doing so. But for some, getting engaged more fully is the way to go. Volunteering for one of the many Burning Man activities is one way to enrich your experience and engage in the festival in a meaningful way. This article is one of several we plan to publish on volunteer opportunities. We hope others will contribute their experiences as volunteers, helping to identify situations that are well suited to people in our age group. 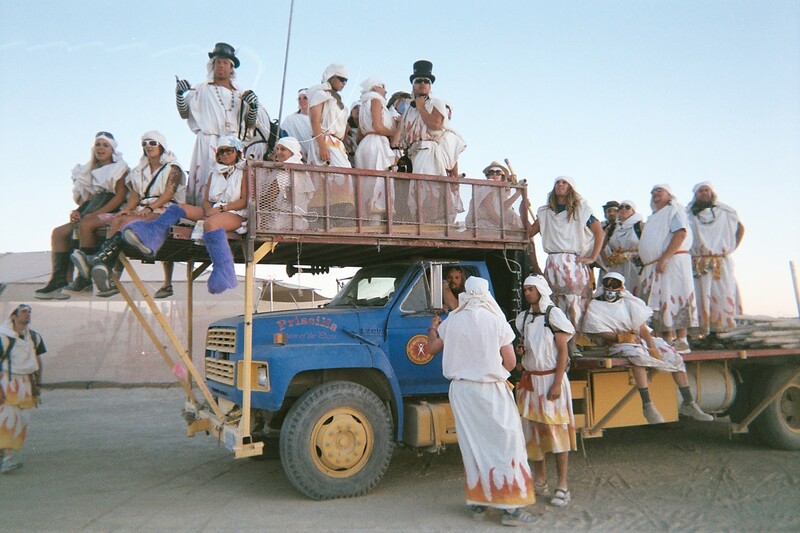 Many of you who read this site already know that my wife and I stay at Lamplighters camp, but you may not be aware of the fact that everyone at Burning Man is eligible to volunteer as a Lamplighter any evening. Lamplighters light the city nightly in a ceremony that has become an iconic part of the Burning Man experience. It takes volunteers from throughout the community to move nearly 1,000 kerosene lanterns out each night. We generally begin the process at 5 p.m., which is when volunteers should arrive at Lamplighter’s temple adjacent to Center Camp. One of the first things volunteers do when they arrive is sign up for a specific duty. There are three volunteer roles to play in the ceremony – carrier, lifter and support. Carriers walk with a post supporting 10 or 12 lamps which are put one by one up on wooden lampposts. Lifters pick the lanterns off the posts with long, specially designed polls and hoist the lamps up to hooks near the top of lampposts. Support people make sure the lamps stay lit and help lifters get lamps onto their polls. For people our age, I generally don’t recommend the carrier role. I’ve personally done it (once!) and it’s fine if you’re a strong person with a good back. But it’s the most physically demanding job and should only be undertaken if you’re confident you can handle it. To me, lifters and support are better jobs for us. By the way, if you don’t want to walk in the ceremony, you can also volunteer as a rober — helping drape the ceremonial Lamplighters in appropriate garb. And, to top it all off, you get a specially designed Lamplighter charm for being one of our volunteers. You can learn more by inquiring at Lamplighters camp or simply by showing up at the Lamplighters temple at 5 p.m. Hope to see you there.